I came across Nir's blog a few weeks ago and was "hooked" since. Nir writes about products, business, and psychology. Writes really well, not only informative but also very engaging, with lots of examples and practical advises. If you're building products, especially technology products, then this blog is a must read for you. If you don't have time to dig deep into Nir's blog, you can buy and read the book instead. 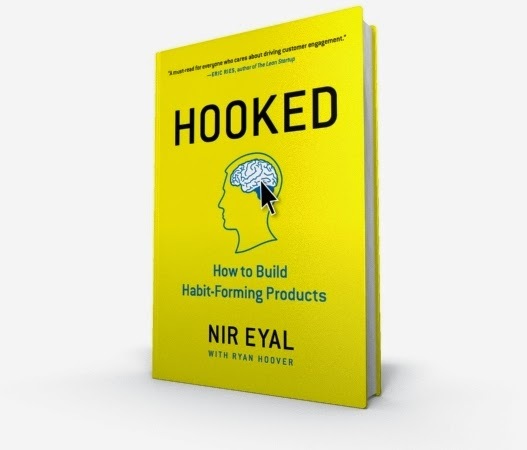 "Hooked: How to Build Habit-Forming Products" it is called and it's available on Amazon since few days. Book is structured around the "Hook" model that Nir has invented. I was writing about this model from a product manager perspective some time ago here. In this video, Nir himself explains the model. I found "Hook" model very powerful framework that should be adopted by anyone who creates products. It provides structure for a lot of practices and tricks that you probably already using. In the book, "Hook" model being explained with all details and examples, one would need to fully understand it. And the most importantly, it is a very practical book. Literally, you finish a chapter and you're ready to apply the knowledge immediately. "Hooked" is a great book for both people who create products and for those who use them. It will help creators to build engaging products. And will teach consumers to spot cases when somebody trying to manipulate them. As mentioned in the book: we can create habits for good or for evil, so they become addictions. Let's all make sure that products we create form only good, positive habits and make the life of our users better.